First I will discuss what happens in this issue. Samson, with the help of the Ring Master, was out to “cure” Bruce Banner. So, into the mind of Banner Samson went to talk to Bruce, Green Hulk and the Grey Hulk. The three battled for control of Banner’s mind – and we follow along as they remember Bruce’s childhood, and his abusive Father – who ultimately killed his Mother – and his alienation of his formative teen years – even his suppressed college years. In the end, Banner’s Mother was the figure who convinced the three personalities to merge into one body – and thus was born – the”Smart” Hulk! That’s right! It’s the elusive 3rd printing of #377! 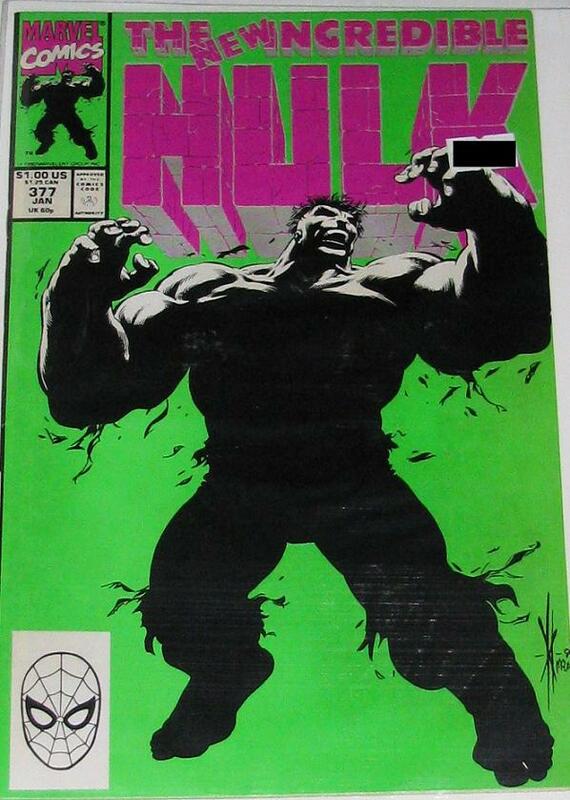 Anyone who has this issue has a rare piece of Hulk history. I did find it listed in the Comic Book Data Base – but the information on the site isn’t exactly correct. See, if you look at the little price box at the top, the original price was $1.00 – but the 3rd printing was released much later – and has a price of $1.75. In fact, if you look at the copyright information – the original is dated 1991 – but the 3rd printing? 1994. Three years later? I would love to know the story behind WHY this was released so much later. It’s an oddity to be sure – and I am really excited to finally have one on my collection! 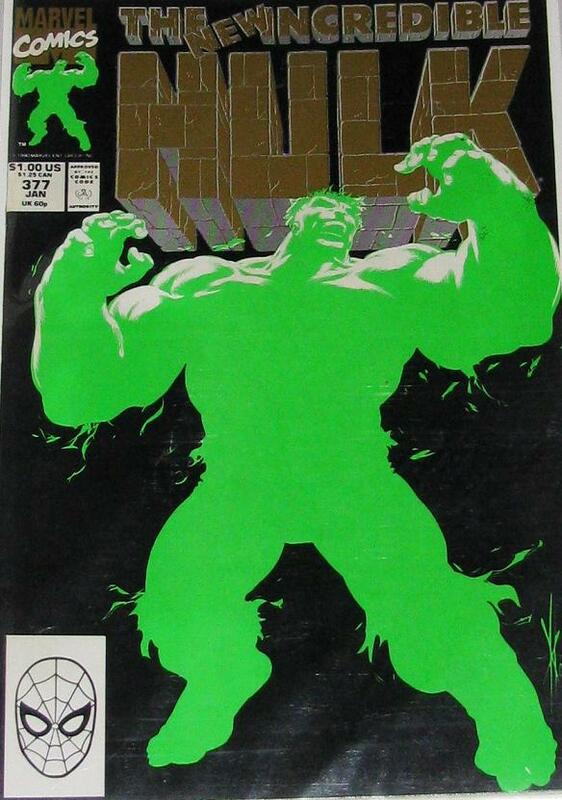 Hope you guys are as impressed as I was about this little known comic in the Hulk series! So, thank you Gary Miller for making me aware of this great issue! – boy it was a hard one to track down! And good luck to anyone out there who is now on the hunt! All three copies! Side by side! 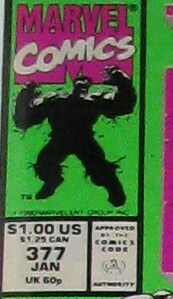 This entry was posted in Comic Review, Green Hulk, Grey Hulk, Hulk Comics and tagged 1990, 1994, Incredible Hulk #377. Bookmark the permalink. Wow! That is incredible I only got the first printing. Never seen the other printings before. Never saw them released over here. I love that you posted this, because I believe this is exactly what is going to happen with the Hulk in the avengers movie. They basically introduced us to Samson in the movie, though no one would have picked up on that if they didn’t know the story. But yea, I’m sure they’re going to introduce a “merged” hulk as he progresses through marvel’s little cinematic project. Wow the 3rd printing is truely awesome, ive been trying for so long to track down a copy any pointers(ebay have none). I have the first and second print, but must have the third. That really has cheered my day up. I don’t think so. Has each actor gets older & asks for more money they will be replaced younger, cheaper actors to play the lesser known Avengers, Hawkeye, Vision, Scarlet Witch etc. Marvel have no interest in promoting Hulk above the other characters. That is slim at best. Samson belongs in a Hulk movie. That can’t do a merged/Professor Hulk until they make Hulk talk, introduce Grey Hulk etc. Fact is Hulk as had two blockbuster movies made, neither film have had the impact of Iron Man, Blade 2, Spider-Man 1 & 2, X-Men 1 & 2 etc. Merged Hulk is one of my favorite incarnations. Some people as you said Ratchet,did not care for him. In fact some compared him to Superman. I disagree with that. David has said in interviews this was his favorite incarnation. This leads me to ask why he didn’t stick with him. 425 introduced Savage Banner which was the start of the end. Does anyone why David did this? He said still had the merged hulk but why did he want to change things? Wow, I am once again humbled. 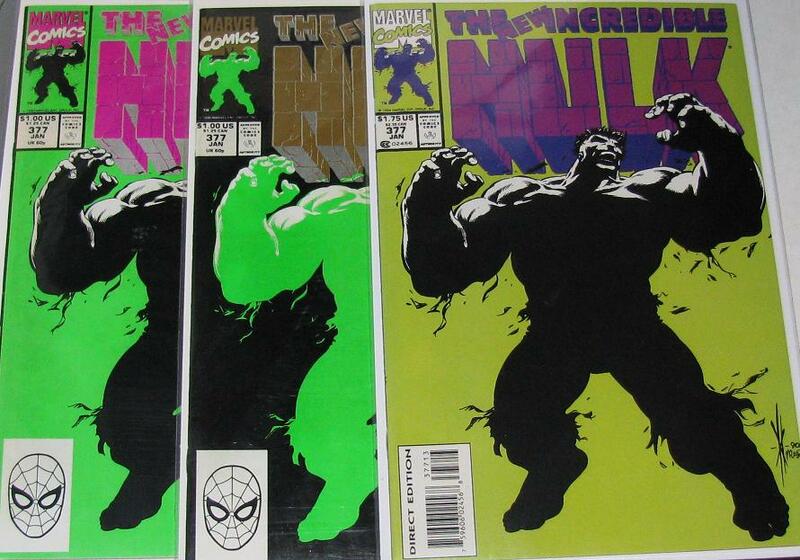 WTG on finding one of the few 3rd printings the Hulk’s ever had! It took me a while to find this one also, so don’t feel bad. Count me firmly in the anti-Merged Hulk camp. The first few issues used the concept well enough, but I quickly tired of a Hulk who would never transform back to Banner, and had none of the inner turmoil (IMO) that distinguished the Hulk from every other superhero out there. The Hulk’s book should NEVER be “just another superhero comic,” and that’s what it became after the merger in this issue. It was a hard one to track down – but man, am I glad I did! Gary,I guess you probably didn’t like a good portion of Mantlo’s run either. I am looking forward to reading your updated blog tonight. I agree with you on most points about the current mysteries involving the Red Hulks. It is interesting to see where this story will go today. Believe it or not, I enjoyed most of Mantlo’s Banner Hulk run. 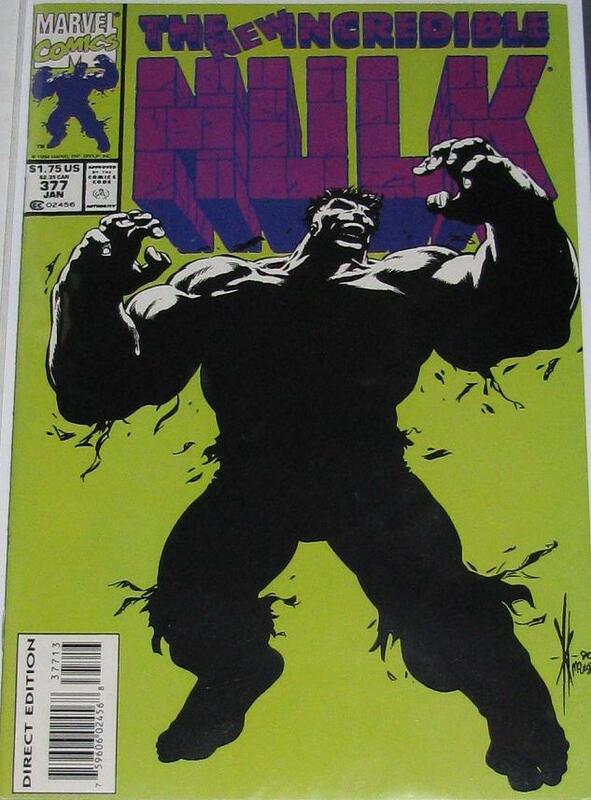 It’s the era when I started reading the character, for one; and also, there wasn’t really any stability to the status quo except for maybe the middle third of that era (the smart Hulk era specifically, #272-300, middle third being the #280s). I absolutely LOVED the stuff with Nightmare through the #290s, purple prose and all. What was it about Mantlo’s era that made it ok with you? I thought David did well in showing the inner angst in the Hulk even without the transformation. I also thought the Pantheon were interesting. My problem was the way he ended the Pantheon era. There was too much left unexplained about them. For me that’s when his first run jumped the shark. Even the novel David did seemed weaker. Savage Banner was and is a bad idea. Funny that the third print is the hardest to get, but it was my first issue of 377. The second print was my second, and i just bought the first print. Finally found the third printing then purchased 2!!! So glad to them in my collection. Nice! Always good to hear! I have 3 in my collection now! I never knew there was a 3rd print of #377 till I looked here and I only saw one copy on ebay and it sold for $ 125 !! So I thought it would be hard to find but I e-mailed down to a nearby comic shop and luckily they had a copy and it was cheap and they are sending it to me now as we speak through the mail. It is my x-mas present to myself and to my collection. Now I have all 3!!!! And with no fuss or muss finding it. I still don’t have this one – might need to remedy that! I went to my LCS last week in Denmark, and the only Hulk #377 he got was the 3rd print in VF+ condition. So I bought it for $4. Score for me! I have a first print #377 but the cover colors don’t match anything ive seen anywhere. Its listed on ebay for 999.00 until I can find more info on it.